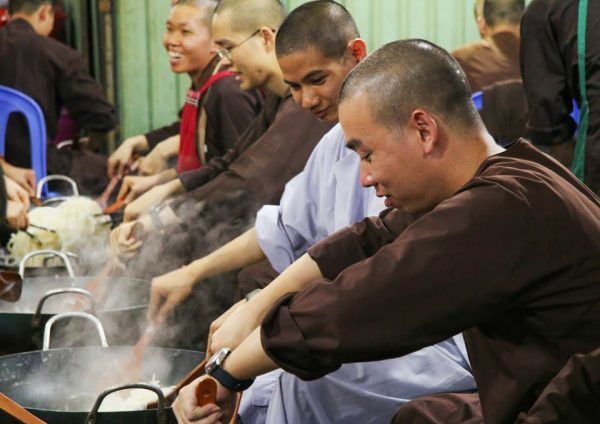 We don’t know exactly when Buddhism started to move into Vietnam, yet we do know that it has become a vital part of life for the locals, and it definitely makes Tet in Vietnam very special. Regardless if the Vietnamese are Buddhist, many of them visit a pagoda for Tet. In this article, we will first look at the tradition of visiting a pagoda for Tet in Vietnam. Second, I am going to walk you through one of my favorite celebrations at one of my favorite pagodas to give you a true taste of this special holiday tradition, as I have a chance to be one of the volunteer photographers there. 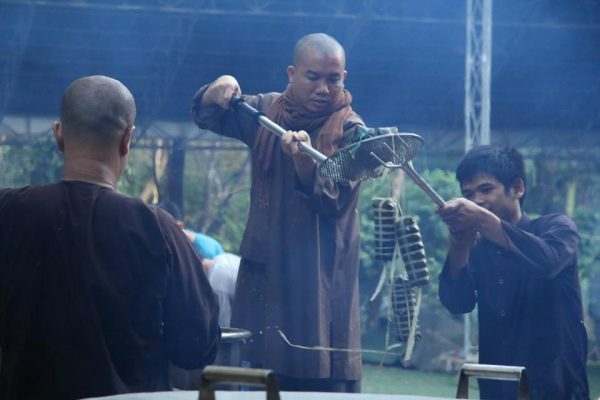 If you are still not sure how vital Tet is to the Vietnamese, take a look at this article. Several days before Tet, most people busy themselves with house decoration. In the suburban and rural areas, people make jams, sticky rice cakes, and other types of traditional cakes to prepare for Tet. And at the sacred moment of New Year’s Eve, after worshipping the ancestors, many families choose to visit a pagoda to pray for their new year. Nonetheless, New Year’s Eve is not the most significant moment to visit a pagoda! 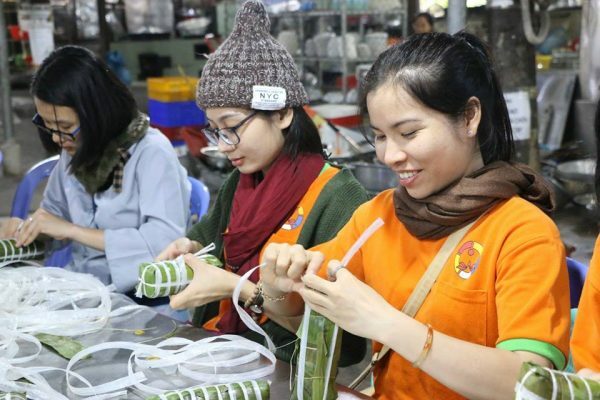 From across the country, the first day of Tet is usually the busiest day. Families reunite and pay their special pagoda a visit. If you happen to be in Hanoi on this day, don’t visit Tran Quoc Pagoda, Ngoc Son Temple, or the Temple of Literature in Hanoi, since an ocean of people will have you feeling like you need some air. If in Hue, you should not hesitate to visit their very sacred pagodas. And as you are in Saigon, the pagodas are not too crowded, as most people have traveled back to their hometown. We arrive at the pagoda in a cool morning, a few days before Tet. The forest greets us with a breeze and an inexplicable feeling of a fresh year to come. The pagoda is in a valley. From the highway below the mountain, you have to drive three kilometers uphill, park at the gate and descend the mossy stairs to the valley. 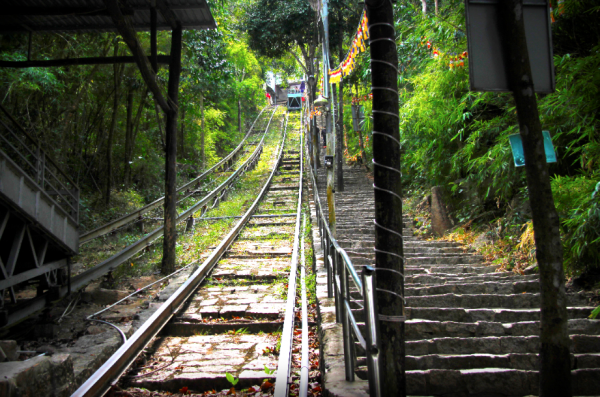 If you cannot walk the stairs, you can take the cable car. Some people know that this pagoda has one of the most impressive, huge and lively Buddha statues! However, what makes this place special is how people live and work together. It’s an inspiring place to visit or to retreat to for a few days. Candies (also called mut in Vietnamese) are among the most typical snacks made during Vietnamese Tet. It seems that sweetness is the traditional symbol of happiness. That explains why candies appear in all traditional celebrations, including Tet. 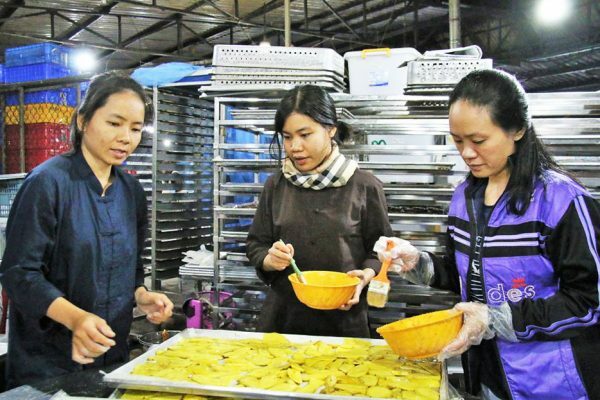 Apart from those bulk candies produced by global companies, the Vietnamese like to make their own candies with delightful flavors like peanut, ginger, annona, mango, and banana, to name just a few. All of these sweets require time to make. This creates a chance for people to reunite, work together, have fun, and transform their happiness into candy. 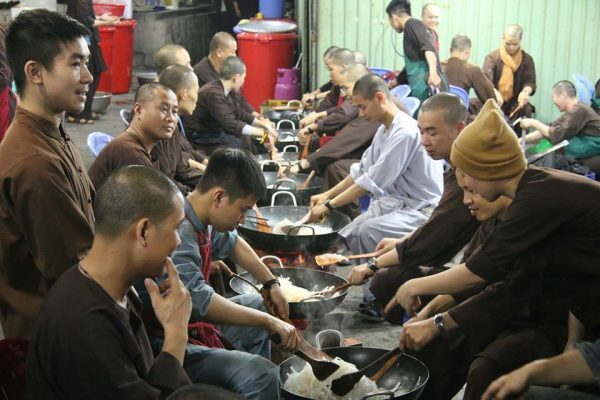 At the pagoda, hundreds of people will gather to make the candies, including not only the monks and nuns but also many Buddhist families and youngsters. Some people take their whole family to the pagoda so that they can enjoy Tet in an altruistic and dynamic atmosphere. You may still see plastic bags in use. However, the abbot of this pagoda has been making a great effort to reduce the use of one-time plastic. Several times, I worked with the environment team of this pagoda during big celebrations and witnessed how tons of garbage was cautiously sorted into ten types before being disposed of! It is also in this pagoda that people have set up a big non-detergent dishwasher so as to reduce the disposal of chemical soaps into the city and surrounding nature. One of my favorite candies is sliced coconut. Let’s discover how to make it! Since this one is easy to make, you can do it at home! You need a very big pan, some old coconuts, and sugar. First, separate the edible part of the coconut from its shell, and slice the meat into three-millimeter thin, ten-centimeter long slices. After, wash the coconut slices twice and soak them in clean water for 12 hours to get rid of the oil. Next, wash these slices twice again, and wait until they dry. Then, mix sugar with coconut slices with the above-mentioned proportion and wait for ten hours for the coconuts to fully absorb the sugar. At this point, the coconut will become slightly transparent. Heat a very big pan until it gets quite hot, then pour the sweetened sliced coconut in, and continue to heat. The sliced coconut should be stirred throughout the cooking process. When the coconut gets very dry, you can take it off the heat and wait for it to cool. 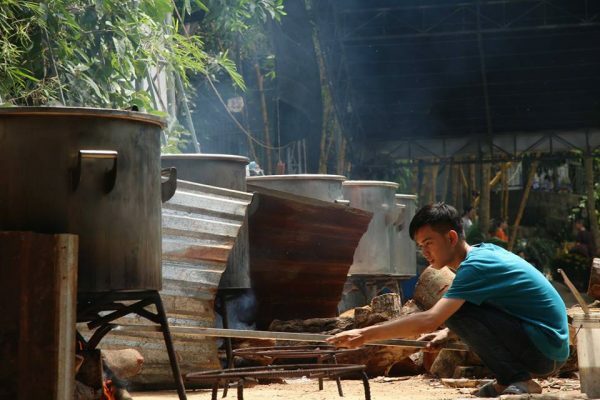 If you see or smell sticky rice cakes being made, that means Tet is just around the corner. 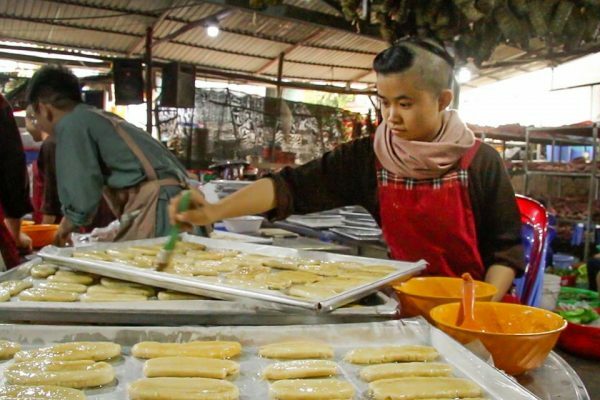 In the north, people gather and stay up throughout the night to make the square green sticky cakes (Banh Chung). 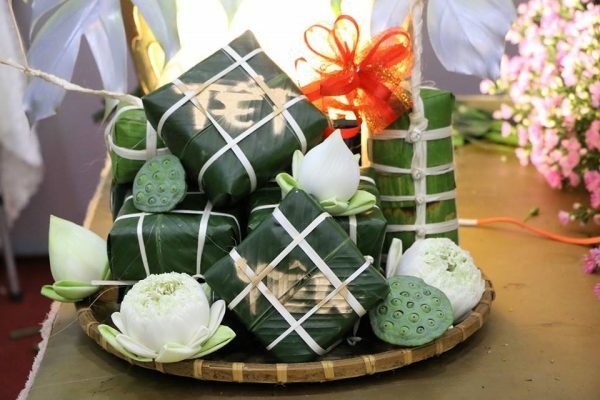 In central and south Vietnam, the cylinder green sticky rice cakes wrapped in banana leaves (Banh Tet) are more popular. With the passage of time, not many young citizens know how to make a proper traditional New Year’s cake! 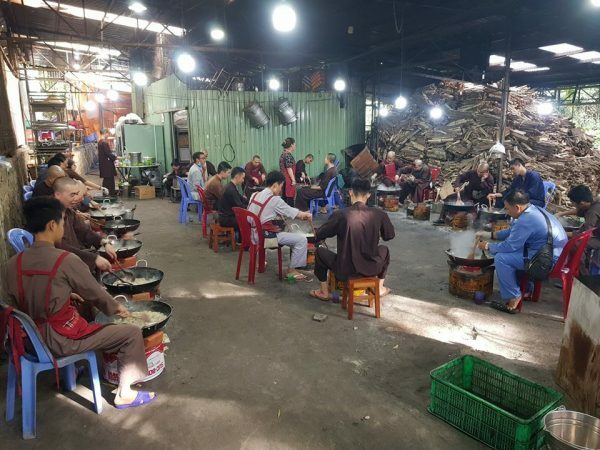 This is why I find it very interesting to visit a pagoda four days before Tet in order to understand how to make such delicacies. A few days before cooking time, banana leaves are washed and dried to prepare for the wrapping process. As you walk around the pagoda, you will find hundreds of young people concentrating on their work. Most of them are college students and fresh graduates from across the country. Inspired by the ideals set forth by the abbot such as giving, these youngsters choose to dedicate their free time to social activities. They, despite their different backgrounds, share the same welcoming attitude that warms the heart. As we make the cakes, the abbot visits the kitchen. With a soft English accent, he reminds all attendants to speak in English. This small action is just among the pagoda’s many efforts to enhance the English communication skills of the people. 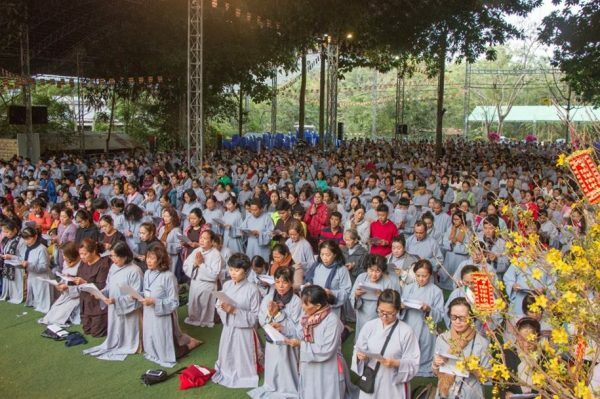 According to the abbot, it is vital that each of the Vietnamese can communicate in English. Do you remember the last time that your whole family sat together on the last evening of the year, sharing your stories and counting down to the sacred moment? The atmosphere is the same here in the pagoda and the only difference is that your family will include over a thousand people. When golden sunset breaks over the landscape, the main yard becomes brighter than ever. People sit in lines with their happy faces, and in their minds, they recall the whole year with all its ups and downs. At 7 PM, the stage becomes bright. The traditional martial art performance starts the session. Monks and nuns in this forest have to practice martial art daily to train their endurance. After that, a musical performance takes place. 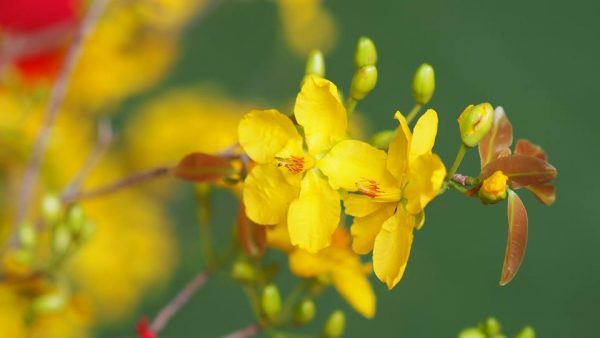 Cheerful, thoughtful, and encouraging an altruistic way of life, these songs remind us of the value of Tet and of the spring in our life. 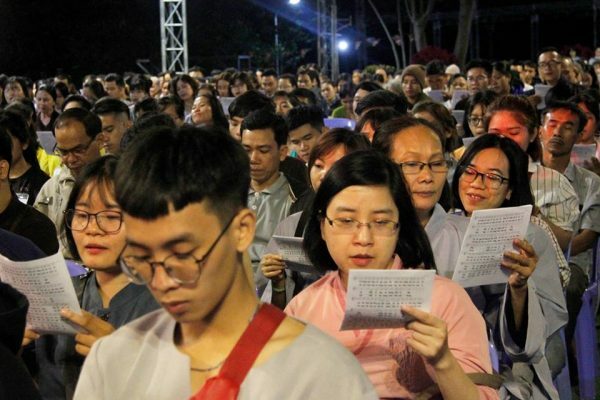 There is also a Tet song that people all sing together. At 8 PM, the abbot gives a speech to wrap the year up. Most of his speeches encourage a proactive living attitude that corresponds to the law of cause and effect, or karma. However, this is Tet so the abbot likes to emphasize why the secret to a happy life is to encourage people to love each other compassionately. At midnight, people bow down to the Buddha. This rite reminds people of the mercies that Buddha made to this world during his many lives, encouraging reverence to the honorable and humility in each attendant. As it gets close to 4 AM, people get up and prepare for the meditation session at four. Among the vast forest, in the breeze that touches every corner of the pagoda, people gather at the rustic main hall, warmly smile at each other. The bell solemnly rings out as if calling back all the wandering minds. Everyone starts to sit in line for meditation. 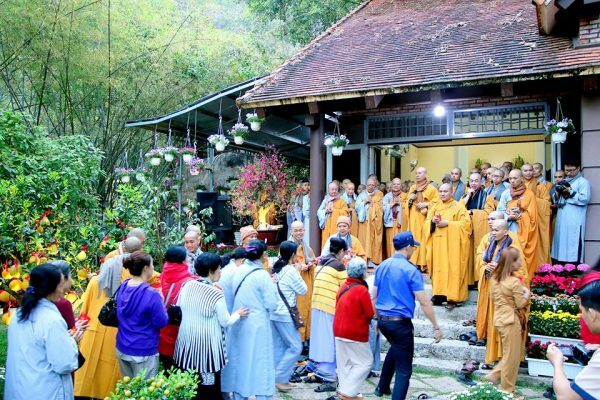 When dawn starts to touch the valley, everyone gathers at the abbot’s place to cheer for a happy Tet. 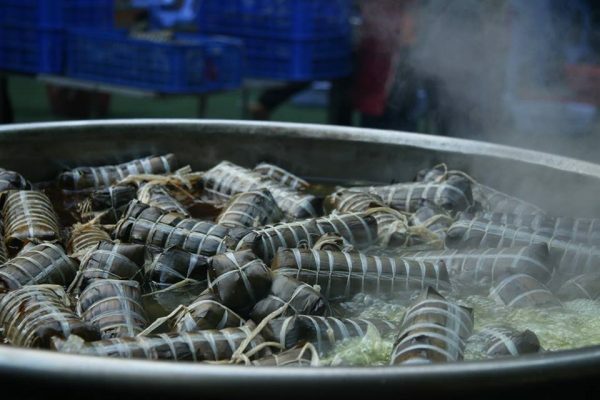 This is another tradition of the Vietnamese. 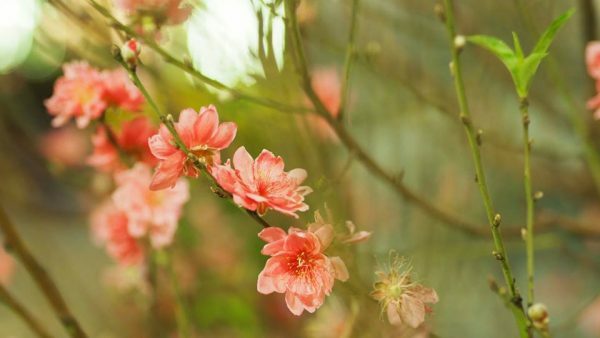 During Tet, people visit their beloved’s houses, have a small chat and tell them good wishes. This habit is called “chuc Tet”. The Vietnamese will start chuc Tet with visiting the most honorable people in their family, usually the grandparents. In return for the wishes, the grandparents will give the children lucky money and the adults some wise advice. In the pagoda, it is the abbot that is first visited. Hundreds of people, hand in hand, cheerfully yet silently walk across the stream to the abbot’s place. After that, there comes the chanting section, in which people pray to Buddha to bless the whole country. The pagoda starts to get crowded at 8 AM. In the kitchen, the dynamic working pace is maintained to prepare thousands of lunch sets. The morale of the volunteers is contagious: happy, proactive, interdependent, and kind. Outside, blossoming flowers fill the yards with their radiant colors. The stream joyfully whispers a fresh melody. People either enjoy nature or meditate on educational pictures of specific causes and effects hung in a yard corner. In the entranceway, lines of visitors keep approaching the big Buddha statue for worship. 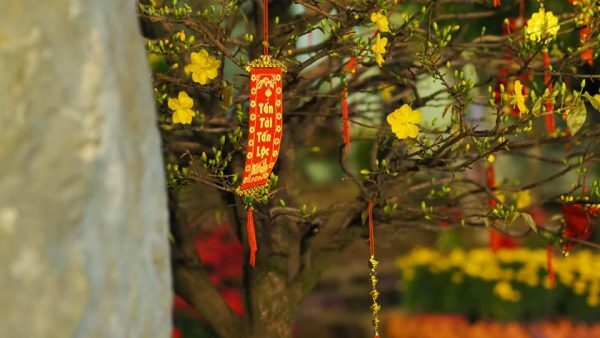 Pro tips: if you visit the pagoda from the first to the fifth day of Tet, after visiting the main hall, you will receive a bright lucky money envelope. As you open it, there will be a note of 1,000 VND and a poem. I particularly like the poem, and you will know why once you receive it! Besides, in each morning, there will be a preaching session from the Abbot, and in the evening, another friendly preaching session from the young venerables take place. The ones in the evenings are given in either Vietnamese or English. The pagoda is led by Venerable Thich Chan Quang. The foundation of their practice states that the only way to attain enlightenment is meditation. The three foundations of meditation are morality, merits, qigong (life energy cultivation). 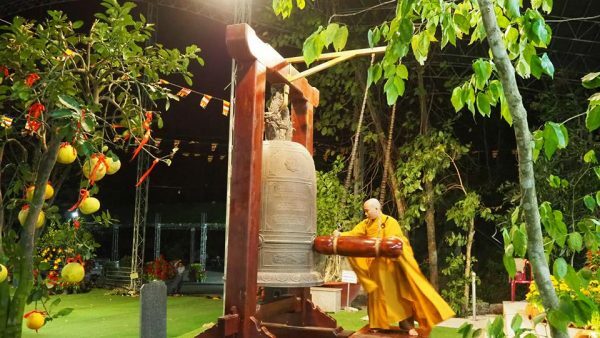 In 2018, Phat Quang Pagoda received the Recognition from Vietnam Federation of UNESCO Association under the name: Phat Quang Pagoda – The Place with Historical and Cultural Values that Educate About Vietnamese Traditions. 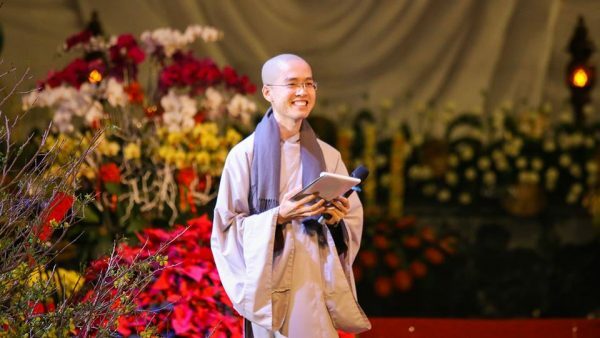 Abbot Venerable Thich Chan Quang is among the pioneers in renovating Vietnamese Buddhist rites and doctrines into modern words. 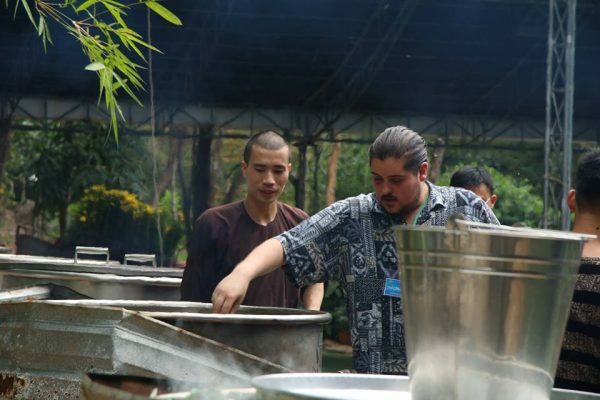 He believes that Buddhism is only valuable if the doctrines are applicable and healing, which means people have to understand what Buddha taught. 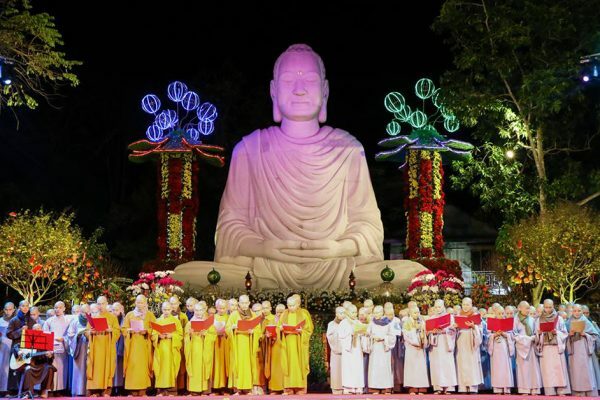 Phat Quang Pagoda is among the pioneers in celebrating the Commemoration of Buddha’s Enlightenment Day. This day marks when monk Gotama attained the fourth stage of meditation, clearly saw the nature of life and became a Buddha. 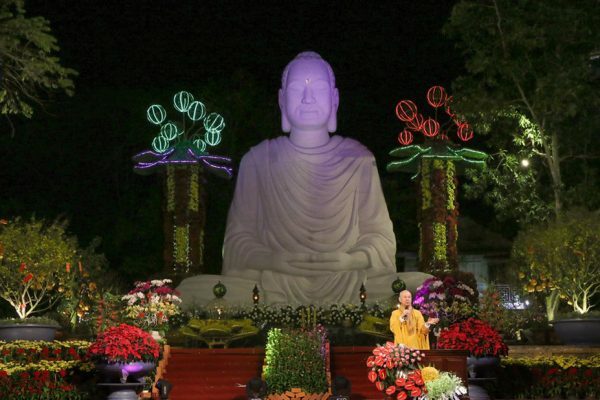 The celebration usually attracts over 20 thousand people attending for spiritual teachings. 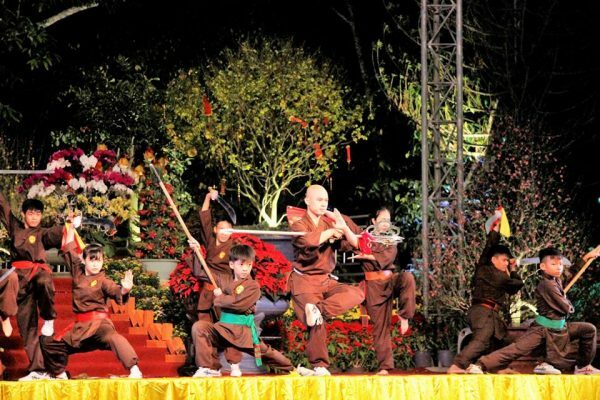 Last January, the pagoda welcomed 35 thousand people to the celebration. 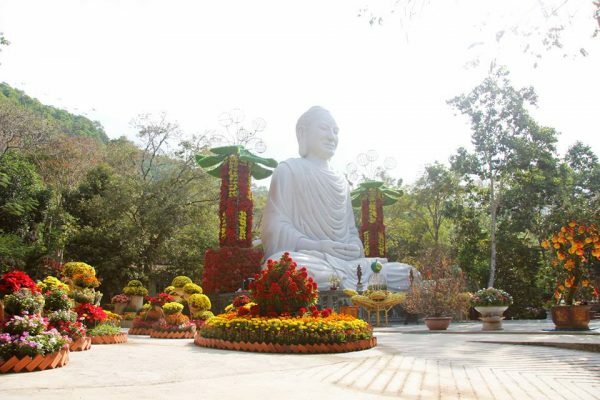 This pagoda is in a valley of Dinh Mountain, Phu My Commune, Ba Ria – Vung Tau Province. From Ho Chi Minh City, you can catch a bus to Ba Ria, and ask the driver to stop at Phat Quang Pagoda. I recommend taking Toan Thang Bus (23 Nguyen Thai Binh street, District 1) which is 95,000 VND per person. You will be dropped off at the foot of the mountain. From there, grab a motorbike taxi to the pagoda gate. It will cost 30,000 VND. You should have your passport (or visa) with you if you wish to stay overnight. The pagoda is freezing in the morning. You will need to wake up at 4 AM for meditation, so make sure you have proper clothes. 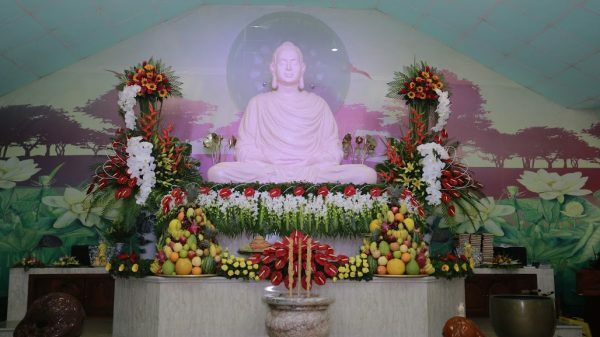 If you are looking for a leisurely retreat, Phat Quang pagoda might not be the place for you. However, if you want to challenge your endurance and experience a very beautiful tradition, don’t hesitate to stay up to a week in the pagoda. The mind is just like lights of the full moon. The post Visiting Pagodas for Tet Holiday: A Vietnamese Tradition appeared first on The Christina's Blog.